Houston skyline photo, with 5 Houston Center, which sold earlier this year. Houston office buildings have been selling briskly in 2017. HOUSTON – (Realty News Report) – For folks who sell Houston office buildings for a living, Thanksgiving should be extra special this year. After a paltry $300 million in office building transactions in 2016, the annual sales total will be well into the multi-billions by the time the last deal closes in 2017. And there are still more closings on the way. Before the end of the year, Brookfield Asset Management is expected to close on its $875 acquisition of Houston Center in Downtown. HFF is handling the sale of this four-building, 4.2 million SF office and retail complex. When the oil markets crashed, Houston office buildings were shunned. As oil companies laid off employees in 2015 and 2016, Houston’s office vacancy skyrocketed and huge blocks of unused office space were dumped on the sublease market. In 2017, the prevailing narrative is the office market has hit bottom and it won’t fall any further. Oil prices have stabilized. Houston’s job growth improves. There’s nowhere to go but up. The Canadian Invasion: Institutional investors from Canada played a big role in this year’s Houston turnaround. Canadians bought a 49 percent interest in Greenway Plaza and Phoenix Tower from Parkway Inc. for $512 million in April. Then, in the June, it was announced the Canada Pension Plan Investment Board would buy the entire Parkway firm for $1.2 billion. 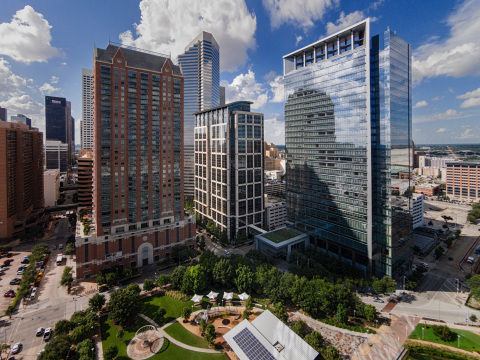 Parkway’s 8.7 million SF portfolio included Greenway Plaza, Post Oak Central, San Felipe Plaza and CityWest Place. Spearfishing: Spear Street Capital of California stepped out to get the ball rolling around the first of the year when it plunked down $272 million to buy three Houston buildings: 5 Houston Center, Energy Center I and 515 Post Oak Boulevard. A few weeks later, Spear Street came back and bought the Exxon Upstream Research complex on Buffalo Speedway for over $50 million. Spear Street seemed to break the ice and things haven’t slowed down since then. Nitya Capital: Last week, another Houston closing was reported. Nitya Capital bought the 208,000 SF Norfolk Tower from TA Realty in a deal handled by HFF. The building had been expected to sell for about $35 million. Nitya, a Houston multifamily investment firm, will redevelop the building and rename it Nitya Tower. The property is near the intersection of the Southwest Freeway at Greenbriar. So Houston’s investment sales are back on track. Space City is no longer a pariah. At midyear, sales were up 300 percent, according to Avison Young. The Fundamentals: But what about office leasing? Houston CRE veteran Bruce Rutherford, a leader in JLL’s Global Energy Practice, says the office market will certainly improve in 2018. Office building construction is tapering off and oil prices are starting to firm. “We are feeling this cycle is starting to turn,” Rutherford says. But when will there be a complete, full recovery in the Houston office market? You know, one with rising rents, rising occupancy, positive absorption and a normal inventory of sublease space. You know, an office market with oil companies expanding their offices, rather than sinking into retreat and shrinkage. A full recovery like that, Rutherford says, is impossible to accurately predict and it may take a while.